Parks and Recreation took a huge leap (literally and figuratively) in their series finale. The episode, “One Last Ride,” aired Tuesday night and gave us major insight to where all of our favorite people from Pawnee ended up. The one-hour finale left us on a super emotional adventure. At the beginning of the finale, we joined the legendary parks crew on a walk down memory lane. Leslie has planned an extensive and very long reunion. Before they can continue, (lucky for everyone else’s sake) Leslie is interrupted by a community member who wants a swing fixed in a local park. The journey to fix the swing allows us to see where each character ends up and for everyone to say his or her final goodbyes. The first flash-forward is to the year 2023, with Donna and Joe. They are happily living in Seattle, still very much in love, and Donna has had major success as a realtor finally opening Regal Meagle Realty. Joe on the other hand is successful as a teacher, but it turns out they just stopped teaching math in the future. (Ummm, is that really a bad thing!?) Donna and Joe have plans to treat themselves! But Donna decides to put her booming funds to another use. She funds, teach yo self, putting her huge heart to great use and creating a foundation for Joe for after school projects. Next on the swinging journey we find the Ludgate-Dwyers. April and Andy moved to DC and we catch up with them on Halloween in 2022. They are having a heated debate, as Burt Macklin and Janet Snakehole, as to whether or not to have kids. (Let’s be real here, Andy just wants someone to play with ALL the time!) April is really not on board with the whole thing, but after a small chat with Sandra Dee O’Connor (Leslie) and Ben at their Halloween dinner, April changes her mind. Fast-forward to Halloween a year later, and April gives birth (in full creepy make up while monster mash was playing in the background) to a beautiful boy named Burt Snakehole Ludgate Karate Dracula Macklin Demon Jack O’Lantern Dwyer, but Jack for short. After the trip with April and Andy to the fourth floor with Leslie, Tom joins Leslie to continue of their swing journey. We join Tom in the year 2019. His restaurant, Tom’s Bistro, seemed to be a huge success and he was looking to expand. However, in classic Tom forum, his restaurant empire collapsed and Tom was left broke. But, leave it to Tom to create success out of failure. Tom wrote a best-selling book called Failure: An American Success Story­. Of course Tom and Leslie find a closed office and are forced to go see the mayor. But Mayor Garry was up to the task! We find out that Garry was reelected mayor after his two-month stint as the interim mayor. He ended up serving 10 terms as Mayor and lived until he was 100 years old. Shortly after that, Garry died in his sleep. 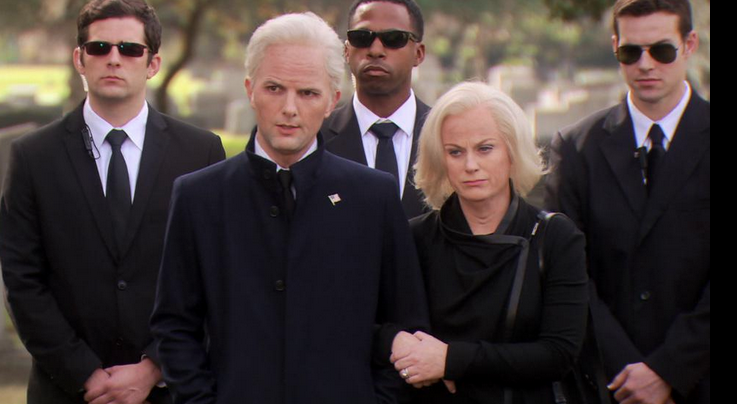 Ben and Leslie are seen at the funeral where once again his name is spelled wrong. He is laid to rest as Garry Girgich. Now here come the tears! Ugh, Ron joins Leslie at the park where he is fixing the swing. After the success of his company in 2022, Very Good Building Company, Ron resigns as chairman to tackle another project. His family is all grown up and his assets are in order thanks to the financial assistance of Ben. But classic Ron wants something more in his life. He did not want to make the same mistake twice so he contacted his favorite workplace-proximity acquaintance, Leslie for some help. Leslie was able to make Ron’s dream come true. She made him Head Park ranger of the National Park in Pawnee. The emotional exchange between the two of them left us with a classic Leslie and Ron moment. The swing was fixed and the journey was complete. Only one more story was left to be told. In classic Leslie fashion, she starts to have regrets about moving forward and leaving her life behind in Pawnee. All Leslie wanted was for everyone to be together once again. While she waited for that to happen, she was crushing everyone and everything all over DC. (Including the VP in charades! Hey, Joe!) Both Leslie and Ben were approached separately and asked to run for Governor of Indiana. After many pro and con lists, they left it up to their friends to help them decide. They returned to Pawnee where Leslie got her wish and everyone was reunited again! Including Ann and Chris!! After everyone catches up, Ben and Leslie decided to leave the decision to fate with a classic coin toss. However before Leslie could announce the toss, Ben made the decision for her telling everyone that she would run for governor. One more flash-forward we joined the whole crew at Indian University in 2035. Leslie was receiving an honorary doctorate where we learned she has been governor of Indiana for two terms and many challenge remain unknown in her future. They also honored with a library in her name, which to Leslie was not so much of her honor with her previous distaste for libraries. 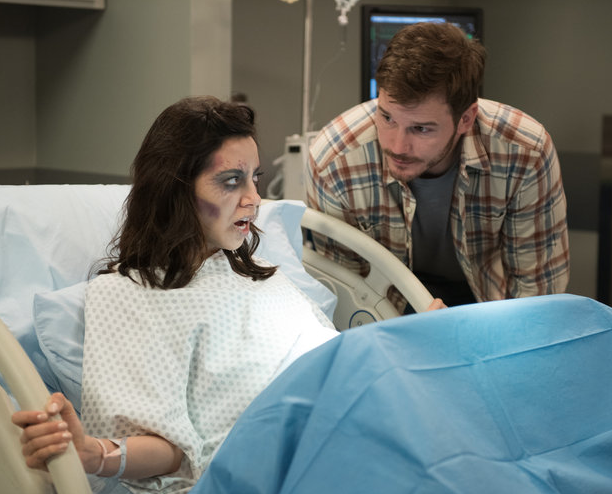 Parks and Recreation has been one of the best shows on Television in recent years. 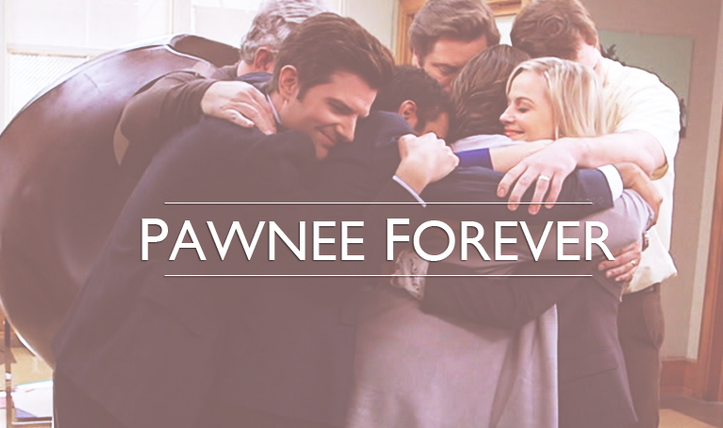 Pawnee, The Parks Crew, and Leslie Knope will be missed dearly.